Also, Sinfonia concertante. Simon Rattle, Berlin Philharmonic Orchestra. EMI 0946 3 94237 2 9 (2-disc set). Dull. Veiled. Foggy. Muddy. Beclouded. Vague. Smeared. These were just a few of the words I jotted down as I listened to the sound of Sir Simon Rattle and the Berlin Philharmonic playing Haydn's Symphonies Nos. 88-92 on this 2007 EMI release. Not that everyone will hear what I heard. If you have inexpensive or undiscriminating speakers or if you're keen on listening to music through earbuds, you will probably not find any problem with the sonics at all. Forgive me if that comes out seeming snobbish, but this set sounded just fine on my computer speakers. It was on the big VMPS RM40s in my living room that it sounded as though someone had deposited a layer of grit and grime over the acoustic window. I'm not sure why the disc doesn't sound as sparkling as it should. I suspect it's because either Rattle or the studio insisted upon recording it live. EMI recorded these performances in concert in February, 2007, Philharmonie, Berlin. I can understand with the tight financial situation in the record industry these days why a studio would want to cut costs by recording live. But you would think that with a conductor so prominent as Rattle, an orchestra so renowned as the Berlin Philharmonic, and a company so big as EMI, they could afford to splurge once in a while on a premium product. Anyway, this lackluster audio response is doubly regretful when you consider that the performances themselves are pretty good. Rattle adds a little zip to Haydn when it's needed, plays it seriously when the occasion calls, and is generally playful in things like the false endings for No. 90. But when I compared the set to the Haydn Symphony recordings of Jochum (DG), Davis (Philips), Beecham (EMI), and Klemperer (EMI) on modern instruments or Bruggen (Philips) and Kuijken (HM) on period instruments, the sound cleared up remarkably. Another lost opportunity, I suppose. Six Suites for Solo Cello. Zuill Bailey, cello. Telarc TEL-31978-02 (two-disc set). "I was unaware of the depths of the music as a young person, but came to realize that there are so many ways of interpreting Bach that it channels where a cellist is at that precise moment. It has become such a personal journey for me." Bach's Suites for unaccompanied cello are quite extraordinary, and they might well be familiar even to listeners not acquainted with much of the composer's music. After all, we've heard the material used in films and television commercials, Bach himself even reusing some of the tunes for a few of his other instrumental works. There are only a handful of recordings of all six Suites available, though (Rostropovich, Mork, Schiff, Isserlis, Fournier, to name a few), so it's welcome having another as good as this one. 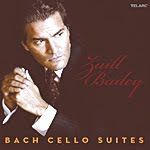 The Suites comprise six movements each of dance-like character, and they are remarkable for Bach's ability to make a single instrument sound like several, with melody and accompaniment, a feat cellist Zuill Bailey pulls off as well as Bach might have liked. Of course, we must also credit Telarc's sound engineers here, too, for capturing all the nuances of the music and the performances. Bailey's interpretations and playing are certainly heartfelt enough and grip the listener from the first note to last. Admittedly, however, I did not listen to them straight through; that might have been a long haul, and I doubt that Bach expected anybody to play them all at one sitting (although there is some evidence of the interconnections among the pieces, so, who knows, maybe Bach did want them played consecutively). Anyway, I listened to them two Suites at a time and found them delightful. Joyous, meditative, lyrical, sorrowful, amiable, exuberant, swaggering, solemn, and regal by turns, the Suites provide a little something for everyone, and Bailey projects all of their many moods in what is probably the best-sounding recording of the works currently available. Telarc have arranged the layout of the Suites three to a disc, with numbers one, three, and five on disc one. That makes sense, I suppose, since numbers one and three are among the most popular of the pieces. More important, Telarc afford the cello a firm, warm, rich sound, without being in any way hard or brittle. What's even more, the engineers nicely capture the soft acoustic bloom of the recording venue, the American Academy of Arts and Letters, New York. The cello, an original 1693 Matteo Gofriller, does appear a trifle close, but the sound is without a doubt vivid. Altogether, another fine recording from Telarc and another fine performance from a man who clearly loves his Bach. Rafal Blechacz, piano; Jerzy Semkow, Royal Concertgebouw Orchestra. DG 477 80888. To begin, a couple of observations: First, DG did not record the album in front of a live audience. Count that a definite plus; maybe the record companies are doing better financially. Second, it's good to see both of Chopin's Piano Concertos on a single disc. There was a time not too long ago that we got only one or the other of the Concertos per disc. These are refreshing signs. Polish composer Frederic Chopin (1810-1849) was only around twenty years old when he wrote his two Concertos, actually writing the Concerto we know today as No. 2 before No. 1, but not publishing them in the order he wrote them. So if Concerto No. 1 seems more mature and has become more popular, it's because it wasn't his first attempt in the genre. Anyway, the reason I mention the composer's age is because it's doubly appropriate that not only is pianist Rafal Blechacz Polish, but he's also quite young. What's more, the conductor, Jerzy Semkow, is Polish. I'm sure Chopin would have been pleased. Blechacz may be young, but he is not youthfully overexuberant or careless. He applies a delicate, graceful, flowing touch to Chopin's dreamily contemplative themes, the performances more about nuance of feeling than about sheer technical brilliance. Although, to be sure, Blechacz appears to possess a good deal of virtuosity as well. These are largely gentle readings, even though Blechacz treats the opening movements with lavish joy and the closing movements' liltingly dance-like rhythms with verve. However good they are, though, it is the middle Larghettos that Blechacz sees as the core of the works, and not only does he present them lovingly and poetically, he blends their lyrical tone nicely with the more-vigorous surrounding movements. This may seem surprising, especially since Chopin marked the final sections Vivace ("very quick, lively"), but Blechacz is able to do just as Chopin requested while maintaining the rhapsodic mood of the center movements. He is always aware of the nostalgic, sentimental Romanticism at the heart of the Concertos. Of course, it also helps that the pianist, conductor, and orchestra play as one to accomplish their goal, and they pull it off nicely. DG pull off the sonics nicely as well. The orchestra is the Concertgebouw, whose wonderful hall has always produced some of the most-glorious acoustic effects possible, giving the ensemble a warm, glowing, but never overpowering ambient bloom. In this 2009 recording the audio engineers manage to create a big, full, smooth, dynamic sound, with moderate transparency and good punch. More important, they reproduce a beautifully rich, solid, and vibrant piano sound, a mite close perhaps, but very lifelike. 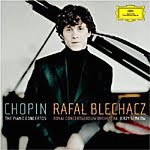 Maybe young Blechacz's new recording does not entirely displace some established favorites in the First Concerto from the likes of Pollini (EMI), Argerich (EMI), Rubinstein (RCA), or Li (DG), but surely he deserves mention as an entirely viable alternative. Also, Till Eulenspiegel's Merry Pranks. Semyon Bychkov, WDR Symphony Orchestra Cologne. Profil PH09065. Over the years, critics have generally frowned upon Richard Strauss's Alpine Symphony from 1915, calling it a monumental picture postcard, lightweight fluff, hammy, and melodramatic. But what they cannot deny is that it is immensely entertaining. Strauss worked on it off and on for several decades, originally intending to compose a traditional four-movement symphony whose theme would encompass the moral purging of one's soul through work and the adoration of Nature. What he finally came up with was an attractive tone poem, the musical depiction of a day's ascent of an alpine mountain, a storm at the top, the climber's contemplation of Nature, and the descent. The work includes twenty-two movements, with titles telling the tale. Here are a few of them to give you the idea: "Night," "Sunrise," "The Ascent," "Entry into the Forest," "Wandering by the Brook," "By the Waterfall," "On Flowering Meadows," "An Alpine Pasture," "On the Glacier," "Dangerous Moments," "On the Summit," "Calm Before the Storm," "Thunderstorm," "Sunset," and a return to "Night." Strauss graphically represents each of these events, and while there may be one climax too many, it is all vivid enough to give the listener the sense of being on the mountain with the climber and experiencing the grandeur and mysticism of the moment. Semyon Bychkov and his WDR Symphony play up the work's most thrilling points, but the conductor tends to rush somewhat the calmer interludes, at least in the beginning, and then slow things down a bit toward the end to conclude the piece on an appropriately lyrical, reflective note. Since the early Seventies, my own favorite recording of the Alpine Symphony has been that of Rudolf Kempe and the Dresden State Orchestra (EMI), to which I must compare all others. By comparison, Bychkov doesn't quite capture all of the splendor and majesty of the mountain's summit, yet he does a splendid job with the still before the storm and then unleashes a fearsome storm itself with suitable fury. I can't say I disliked Bychkov's approach to the Alpine Symphony, but I can't say it inspired me quite the way Kempe's interpretation does, either, the latter transporting this listener to a higher, more exalted plane altogether. 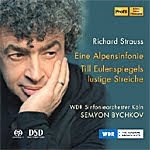 Let's just say Maestro Bychkov does Strauss proud in a slightly more straightforward manner than Kempe. Accompanying the Symphony, Bychkov gives us Strauss's Till Eulenspiegel's Merry Pranks, which comes off a little better, a little more involving--colorful, adventurous, and mischievous, right up until Till's unceremonious demise. Bychkov makes it as humorously impish as it should be. As far as Profil's sound goes, it's quite good, transparent and powerful, with only some small loss of deepest bass a minor concern. The Profil engineers recorded it in 2009, reproducing the audio in multichannel on this SACD, as well as in a two-channel stereo layer to which I listened. Yet even in two channels, one can hear the music's ambient bloom without it drowning out the recording's inherent clarity. We also find a wide stereo spread; a strong dynamic impact, especially during the storm sequence; and more than acceptable orchestral depth. One final note: Although Profil provide all twenty-two of Strauss's movement titles for the Alpine Symphony, they are in German only. Curiously, the folks at Profil include the program titles for Till in English, but not for the Symphony. It seems an odd omission for the English-speaking market. Also, Minkus: Don Quixote (highlights). Jean-Baptiste Mari, Orchestre du Theatre National de l'Opera de Paris (Delibes); John Lanchbery, Elizabethan Trust Melbourne Orchestra (Minkus). EMI 50999 9 67723-2 (two-disc set). Leo Delibes (1836-1891) wrote the rather bizarre Coppelia in 1870, but it is so filled with wonderful melodies that it has been a mainstay of the international ballet repertoire ever since. Its plot involves a shadowy and slightly sinister character named Dr. Coppelius, who fashions a life-sized dancing doll so realistic that a young man, Frantz, about to be married, falls in love with it. You can see the possibilities for fanciful music, and Delibes exploits them to good effect. Coppelia is practically one long, hundred-odd-minute string of greatest hits, the music is so charming and familiar. The 1977 recording we have here by conductor Jean-Baptiste Mari and the Orchestra of the Paris National Opera Theater is among the best, maybe the absolute best, ever made of it. Mari's interpretation is elegant and refined, but it in no way diminishes the robust energy of the work. Indeed, he enhances the long, graceful curves of the music, while providing all the beauty, mystery, and excitement it requires. But here's the thing: When this complete recording of the score appeared on the scene in the late Seventies, I had a hard time finding it. Instead, what I eventually found was a two-disc set of lengthy excerpts from Mari's recording of Coppelia and his recording of Delibes's Sylvia, one disc devoted to each ballet. This wasn't such a bad thing, since there is much in the complete scores of both works that is redundant, and like Adam's Giselle, a little pruning helps. In fact, I doubt that anyone but a Delibes fanatic could tell what was deleted in the highlights discs. Nevertheless, it is nice now to have Coppelia so readily available in its unedited form. 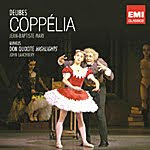 Accompanying Coppelia is the ballet Don Quixote by one of Delibes's contemporaries, Ludwig Minkus (1827-1890). It's a more-conventional piece of music, here presented in highlights performed by John Lanchbery (who also adapted this particular arrangement) and the Elizabethan Trust Melbourne Orchestra in a 1972 recording. While it is still an enjoyable, melodic work, it hasn't nearly the endless stream of great tunes we find in Coppelia; so it comes as something of a filler rather than a competitor to the Delibes piece. Although EMI recorded this music in the Seventies, they remastered the present set in 2009. Compared to their earlier mastering of Coppelia, this new one is marginally smoother and cleaner, with a touch less edge to the high end. In either case, the sound is quite fine, with a pleasant ambient bloom, a good degree of orchestral depth, and plenty of dynamic range. Perhaps the engineers could have picked up a bit more of the deep bass response, but it hardly matters in music so enchanting as this. Lovers of all things Irish will enjoy this collection of mostly Celtic music played on traditional Celtic instruments and featuring the usual slow laments, pastoral ballads, and fast-stepping reels. If there appears to be a certain inevitable sameness about the program, it's probably because you're not a student of this particular genre or you've been listening to too much "Riverdance." 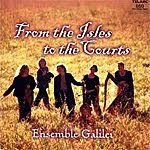 The five ladies who make up the Ensemble Galilei play fiddle, pipes, oboe, recorders, pennywhistle, Celtic harp, viola da gamba, percussion, and bowed psaltery. They sprinkle a little Marais and Corelli as well as a number of their own modern compositions into the otherwise conventional Irish and Scottish collection to produce a well-ordered mix of tunes. I liked the names of some of the newer songs as well as I liked the music: "Winter's Falling Light," "The Dance Goes On," "Under the Full Moon," "Home Fires," "The Burning of the Clavie," "Lake Skybelow," and "Aisling." Older melodies include "Scollay's Reel," "King of Fairies," "Old Grey Cat," "Sgt. Early's Dream," The Fair Maid of Barra," and "Dream Angus." I think you get the idea. What sets this 2000 album apart from the hundred like it is twofold. First, there's the enthusiasm of the players themselves, who display a genuine love for the music they're playing, an uplifting spirit in their performances, and not-a-little fond sentimentality toward their work. Second, Telarc engineer Michael Bishop captures their music-making with an appropriate touch of hall resonance to produce a realistic ambiance that doesn't drown out the details of the instruments. The result is both intimately natural and sonically transparent. I admit that for me a tiny bit of this music goes a long way, but for connoisseurs of the art, the disc is skillful, professional, and pleasantly enjoyable. William Stromberg, Moscow Symphony Orchestra. Marco Polo 8.225268. There is little doubt that Warner Brothers' 1938 production of The Adventures of Robin Hood with Errol Flynn is one of the screen's classic adventures, nor that Erich Wolfgang Korngold's epic music helps the movie immeasurably. What's surprising is that up until recently we have never had a recording of the complete score, only a few minutes worth of the famous "March of the Merry Men" or at best a fifteen-minute suite. Fortunately, composer and restorer John Morgan, conductor William Stromberg, and the Moscow Symphony Orchestra rectify this situation with their recording of every shred of music in the movie, over seventy-eight minutes worth. Fortunately, too, Stromberg and company, by now old hands at this sort of thing, play the music with verve and commitment. The music is so vivid and so engaging, and the playing is so enthusiastic, listening to it is like watching the movie all over again. Stromberg and Marco Polo have given us a whole string of reconstructed film scores over the past few years, and this one joins the very best of them, if not surpassing my favorite, Max Steiner's Treasure of the Sierra Madre, then at least coming close. Korngold was primarily a symphonist and writer of operas, but he spent much time in Hollywood as well. 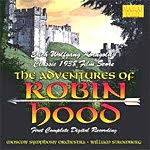 He would surpass himself a year or two later with music for The Sea Hawk, but the music for Robin Hood is plenty good. What's more, presented complete it comprises a wonderfully seamless whole, despite the fact that it is obviously made up of a number of tiny bits and pieces describing and bridging the film's various characters and scenes. As such, it sets a good deal of the mood for the swashbuckling action it accompanies and does so with an easy charm, grace, and wit that make for comfortable listening. The disc is divided into twenty-five tracks for easy reference, and it comes accompanied by an exhaustive twenty-eight page booklet insert of notes covering everything from Korngold's life and music through the making of the movie itself. Moreover, Marco Polo's sound is up to the task of conveying all of the story's musical derring-do clearly and dynamically. It's really quite the complete package. With Warner Brothers having released a gorgeously restored transfer of The Adventures of Robin Hood on DVD and Blu-ray, this new CD of the complete film score complements it perfectly. Wonderful stuff. Jose Serebrier, Royal Scottish National Orchestra. Warner Classics 2564 63236-2. If Alexander Glazunov's name brings to mind little more than the Raymonda and Seasons ballets, don't feel bad; you're probably not alone. He is one of those composers who are known today for only a couple of things, although such composers may have written a huge amount of music. In any case, it's nice to have more of Glazunov's symphonic works on disc, and the Fourth and Seventh Symphonies coupled here are quite appealing, at least the way conductor Jose Serebrier handles them. Oddly, it is the Symphony No. 7 that has acquired the name "Pastoral," presumably because of a small resemblance in the first movement to Beethoven's "Pastoral"; yet it is Glazunov's Symphony No. 4, premiered in 1894, that would seem to have more in common with Beethoven's Sixth. The Glazunov Fourth is a totally charming piece, written unconventionally in three movements, the first of which is a somewhat melancholy Andante that slowly speeds up and evolves into an Allegro. 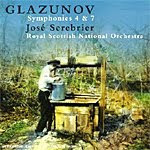 It has all the earmarks of a pastoral setting, with an abundance of melody, which conductor Serebrier and the Royal Scottish National Orchestra take joy in communicating. The second movement is a brief, sprightly Scherzo, and the third movement is like unto the first, an Andante developing into an Allegro, only this time more quickly, and culminating in a tremendously exciting climax. Serebrier and his crew seem to enjoy this music, and the album follows up on two previous Glazunov discs they did of Symphony No. 5 and The Seasons and Symphony No. 8 and Raymonda. The Seventh Symphony is in a more traditional four-movement arrangement. The first movement is moderately fast, with a lovely, sweet, rustic opening. The second, slow, movement is a lengthy and somewhat solemn Andante; the third movement is a Scherzo; and the Finale is a very big, very Russian-sounding affair. Both symphonies are quite melodic, as I've said, although neither has anything in it that is particularly noteworthy or memorable, which is probably why the pieces have been largely forgotten. Nevertheless, the two symphonies are quite delightful, especially the Fourth, and under Serebrier's baton they make for easy, stress-free listening. The sound the Warner engineers provide for this music is pleasantly realistic without being exceptional in any way. It possesses a smooth, natural tonal balance, a good stereo spread, and ample presence. However, dynamics and deep bass seem constricted, and ultimate transparency is limited at best. Also, Le Francs-juges overture. Roger Norrington, the London Classical Players. Virgin 0946 363286-2. 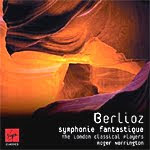 When Roger Norrington made this recording of Hector Berlioz's Symphonie fantastique, originally issued by EMI in 1989, it beat to the punch in the period-instruments field the Philips recording by John Eliot Gardiner and his Orchestre Revolutionnaire et Romantique by several years. I mention this because now that Virgin Records have reissued Norrington's version at a fairly low price, the two discs are now more competitive with one another. Norrington's is cheaper; Gardiner's is slightly better. The trouble with Norrington's performance is that if you compare it to Gardiner side by side, it seems rather stiff. Gardiner seems quite a bit more fluid, while building greater tension and excitement, especially in the final movements. Where Norrington comes off best is in the second-movement Waltz, which is a bit smoother and more flowing than the rest of the performance. Other than that, Norrington is rather mechanical and flat-footed even in the final two movements, which ought to be humorous, exciting, scary, impressive, or something along those lines. I mean, there used to be a time when any self-proclaimed audiophile used the last two movements of the Symphonie fantastique as demo material. So, of the two recordings I've mentioned on period instruments, it's Gardiner who gets and keeps my attention. There are other things to consider, though, like the sound of the two discs. Norrington's recording has the advantage of greater clarity and delivery, while Gardiner's recording has greater warmth and bloom. It would have been nice to have a little of both, but both are compromises of sorts. Still, I wouldn't discount Norrington's way with a period interpretation. As always, he attempts to follow the composer's metronome markings to the letter; it's just that the results here come off sounding more mechanical than musical. Oh, well, fans of Norrington will probably not be disappointed, and, as I say, the sound is quite good. Besides, the Norrington disc offers the Le Francs-juges overture as a bonus, and it is always fun. Also, Octet for Strings; 3 Lieder. Daniel Hope, violin; Thomas Hengelbrock, Chamber Orchestra of Europe. DG 477 6634. 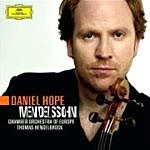 Daniel Hope is fast becoming a leading light of violinists in our day, and this recording is a good example why. Not content merely to repeat yet another Mendelssohn Violin Concerto, Hope goes back to Mendelssohn's original intentions in a manuscript the composer drafted in 1844, a little more than a year before he premiered the work. In the booklet insert, Hope explains that Mendelssohn later made about a hundred changes to the score, the lack of which you probably won't notice in this recording because they're so subtle, like the absence of several overlapping winds before the soloist's entrance in the first movement. But a really big change is the way the composer initially intended for performers to attack the first movement--with "fire." And that's exactly what Hope does throughout the Concerto. Even without all the nuanced changes, this would be an outstanding interpretation for its vigor and enthusiasm. If it's a gentle, traditional reading you're looking for, you won't find it here. This one is new and vital and incisive in the extreme, yet without ever stepping across the boundaries of propriety or sounding overbearing. Likewise, the Octet (performed from an original manuscript the composer meticulously prepared in 1825, eight years before its official publication) comes across with spirit and elation. Then, the program ends with three short Lieder, the third of which, "On Wings of Song," is sublime. DG's sonics are mostly excellent, very smooth, very warm. They lack something in inner detail and definition, but they make up for it with their wide dynamics and impact. These are punchy performances for which DG provide punchy recordings. Well done, all the way around. Willi Boskovsky, Vienna Philharmonic Orchestra. LIM XR24 019. 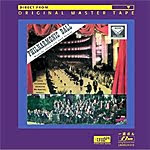 In the booklet insert, Winston Ma, the owner and producer of the high-end label FIM/LIM Music, tells us that friends encouraged him to have among his audiophile remasters "at least one of Johann Strauss's waltz albums from the Decca catalog since these are such famous recordings." Looking high and low for the best possible representative of the series, he settled on Willi Boskovsky's album Philharmonic Ball from 1959 to do up in the XRCD remastering process. It's certainly hard to argue with his choice. Boskovsky conducted the Vienna Philharmonic's famous New Year's concerts for twenty-five years, from 1954-1979, and in the late Fifties Decca wanted to produce an album of music that reflected the kind of program such an event would include. If you are a fan of Mr. Boskovsky, of the Strauss family, or of the Vienna Philharmonic, this album is among the best things you can find. Nobody did the Strausses better than Boskovsky, and no orchestra knew or played the Strausses better than the VPO. Among the selections, you'll find the familiar--the "Blue Danube" and "Voices of Spring" waltzes, "Auf der Jagd," "Pizzicato Polka," "Perpetuum Mobile," and the less familiar-- "Ohne Sorgen, "Transsktionen," among others. 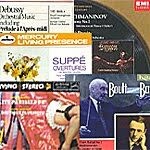 Now, here's the thing: In the past four or five decades, Decca engineers have themselves remastered Boskovsky's early material many times over, and you will find the recordings on this LIM disc in various Decca collections at much lower cost. You just won't find them any better. LIM, a division of FIM Music, uses only the best master tapes they can find and remaster them in the celebrated XRCD process, using the JVC replication plant in Japan. The results are very good and very expensive, but unless you have a quality sound system you may not appreciate the improvements. Indeed, after comparing several of the cuts on this disc with ones on Decca's own discs, I concluded that most listeners on mid-fi equipment probably wouldn't notice any difference. But that's not the point, is it? These discs are for audio connoisseurs who want to extract the last ounce of fidelity from their music and hang the expense. For the first few moments of my comparisons, I wasn't sure I heard any differences myself. Then, flipping back and forth between the LIM and the Decca, I began to hear them. The Decca was slightly foggier, duller, glassier, and less dimensional. The LIM clarified the midrange, seemed to tighten the bass and extend the treble, and further opened up the soundstage. Were they night-and-day differences? Not at all, just very, very subtle. Worth the money? Probably, to the well-heeled audiophile. In addition, both the Decca and the LIM displayed a touch of hard glassiness in the upper midrange, which I assume to be a part of the original master tape. Finally, Ma explains in the booklet that he chose to leave the master tape hiss in the album, rather than use Dolby SR to remove it. Although the hiss is audible during quieter passages, it presents no problem to one's enjoying the music. On February 1, 2010, Naxos--one of the world's leading classical music labels and an industry leader in streaming audio and music education--launches Naxos Video Library, a new and unique streaming subscription music service. The Naxos Video Library (www.NaxosVideoLibrary.com) kicks off with more than 250 full-length videos of concerts, operas, ballets, and documentaries from prestigious performing arts labels such as Arthaus Musik, Dacapo, Dynamic, EuroArts, Ondine, Opus Arte, Medici Arts, Naxos, and TDK. Featuring performances from legendary artists including Placido Domingo, Luciano Pavarotti, Martha Argerich, Gerald Finley and many more, videos are available to stream at 700 kbps (standard quality) and 2 mbps (high quality), and the service is compatible with both PC and Mac computers. Within three months, NVL expects to make approximately 500 titles available to stream. * Advanced search functionality, including the ability to search by category, role, composer, artist, production, personnel, work venue or festival. In 2004, Naxos launched Naxos Music Library, which has become the industry standard in streaming audio music education, with more than 562,000 tracks of music. In addition to the Naxos Music Library, Naxos also offers the Naxos Music Library Jazz database, Naxos Spoken Word Library, an audiobook resource, and the NML Sheet Music, a downloadable sheet music database. All of these services firmly support Naxos' commitment to Music Education. Also, Mozart: Violin Concerto No. 4; Silver: Creepin' In. Nigel Kennedy, violin; Polish Chamber Orchestra. EMI 0946 3 95373 2. Following on the heels of DG's fine release of the Beethoven Violin Concerto with violinist Vadim Repin, Riccardo Muti, and the Vienna Philharmonic came this EMI issue with Nigel Kennedy playing the violin and leading the Polish Chamber Orchestra. Both discs are recommendable in their own way. Whereas the Repin performance is rather big-boned and old-fashioned, the Kennedy interpretation is somewhat leaner and marginally more dynamic. I can't say which reading I enjoyed more. Kennedy is the more extreme, as we might expect from this often flamboyant source. He takes the first movement very quickly, infusing it with a good deal of energy and enthusiasm. I recall that he recorded the Beethoven once before, in the early Nineties, and it had a rather slack first movement. No such thing here. However, as a complete contrast, he takes the second movement Larghetto more slowly than I can ever remember it done. His manner is not exactly languid, though, and many listeners will find it lovely. Be that as it may, it's hard to find any reservations about the final movement, which is as joyous and bouncy as any you'll hear. 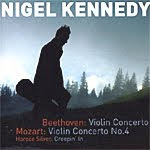 As companion pieces, Kennedy chose Mozart's Fourth Violin Concerto, which he does up in fine form, the booklet notes telling us that Kennedy performs the cadenzas in "jazz and other non-classical styles...which nevertheless keep the composer's own material very much in mind." They do no harm. Then, in an eccentric twist that probably only Kennedy could get away with, he ends the program with a brief jazz piece, "Creepin' In," for violin and double bass by Horace Silver. Because Kennedy conducts a relatively small ensemble, it helps to improve transparency, yet at the same time EMI's sonics maintain a warm, ambient glow around the music. It is traditionally good EMI sound, pleasantly atmospheric, without the bloom interfering too much with inner detailing. Incidentally, I don't usually trust albums where the performer's name on the cover shows up larger than the composer's, and in this instance Kennedy has his name in capital letters and practically in lights. I'll make an exception. Also, Asteroids. Sir Simon Rattle, Berlin Philharmonic Orchestras. EMI Classics 0946 3 69690 2 (2-disc set). Gimmicks, gimmicks, gimmicks. If you ain't got a gimmick these days, you ain't got a record. 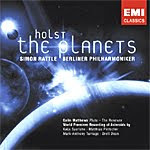 I mean, how often have record companies issued Gustav Holst's The Planets? Maybe 800 times in stereo alone? So, the gimmick here is that EMI not only added Colin Matthews's "Pluto" to the Planets lineup, but they included a second disc called "Asteroids," additional space-related compositions, plus a "Making-of" video enhanced for computers. I wish I could say much of it works. Sir Simon Rattle had already recorded The Planets digitally for EMI with the Philharmonia Orchestra, so why he thought he needed to do it again is anybody's guess. Certainly, the performance seems not much different than before. It's still a fairly conventional interpretation to my ears, with Matthews's "Pluto" having the unfortunate distinction of not being up to the quality of Holst's work and the celestial Pluto not even being a full-fledged planet anymore. Then, on a second disc there are four brief, spacey works: Kaija Saariaho's "Asteroid 4179"; Matthias Pintscher's "Towards Osiris"; Mark-Anthony Turnage's "Ceres"; and Brett Dean's "Komarov's Fall." They last from four-to-seven minutes each, and with the exception of Turnage's piece, which turns somewhat jazzy in the middle, they sound a little like sci-fi movie soundtracks. Also, with Rattle in charge of one of the most gorgeous-sounding orchestras in the world, it continually mystifies why he or EMI seem to insist upon doing most of his new albums live. I suppose it's a cost-saving move, but still.... This album is described as having been "recorded in concert: March 15-18, 2006, Philhrmonie, Berlin." Unfortunately, the sound is ordinary at best, often clear and realistic in the upper midrange and treble but just as often vague and ineffectual, without much in the way of strong dynamics or deep-bass support. Just listen to Andre Previn's much older EMI recording (or Adrian Boult's EMI recording, for that matter) and check out how much better The Planets can really sound. Plus introductory comments. Juliane Banse, soprano; Giuseppe Sinopoli, Dresden Staatskapelle. Profil PH07047. This doesn't sound like a recording. It sounds for the most part like real music. Unfortunately, as with any live music, you have to take it warts and all. The Profil engineers made this disc from a live, 1999 radio broadcast. While the sound has a wonderfully spacious quality, with plenty of dynamic contrast, stage breadth, and orchestral depth, it also has its fair share of audience noises, including the inevitable applause at the end. Still, it might be worth it for the remarkable liveness of the experience. 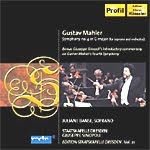 The late Dr. Sinopoli generally gave his listeners their money's worth, namely length, and it works in Mahler's Fourth. The Fourth Symphony wears its heart on its sleeve, so to speak, and conductors as varied as Klemperer, Haitink, Szell, Abbado, and Reiner have given us their own very special and very different interpretations. Sinopoli offers up every repeat, elongates every phrase, and plays up every pause in the work, yet it never sounds odd or contorted as, say, Klemperer's reading does in part. In fact, Sinopoli's performance is exceptionally moving and always involving. I was not quite as taken, though, with the integration of soprano Juliane Banse's voice with the orchestra in the final movement. I could never quite locate her exact position on stage, her voice seeming oddly out of place, slightly too big for the occasion. Nor did I find her voice as angelic or childlike as I prefer for the role. Nevertheless, she makes a touching contribution to the work's close. In addition to the Fourth Symphony, Dr. Sinopoli offers up about seventeen minutes of comments (with musical excerpts) on the Symphony, comments which, according to the booklet note, originally prefaced his performance of the piece. However, the commentary is in German, so unless you speak the language you'll have to read some of the booklet-note translations to know what's going on. Also, The Most Dangerous Game. William T. Stromberg, Moscow Symphony Orchestra. Naxos 8.570183. For those of you who missed it the first time around on the full-price Marco Polo label, Naxos now offer these two classic Max Steiner film scores on a budget Naxos disc. Lovers of old film scores may safely continue to cheer John Morgan's reconstruction of this music. 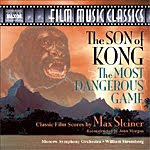 The disc offers works of a slightly lesser quality than, say, Steiner's King Kong, but it is fascinating, nonetheless, and executed in superb sonics. Why the combination of The Son of Kong and The Most Dangerous Game? Well, for one, both scores were written by Steiner during his early days at RKO. Overworked and tired, he would soon submit his resignation, only to go on to greater glory at MGM and Warner Bros. with projects like Gone With the Wind and Casablanca. For another thing, he wrote the scores back to back while RKO was using the same sets to film both pictures. Of the two pieces of music, it's The Most Dangerous Game that stands out, being more original, less derivative, than The Son of Kong. Based on the famous Richard Connell short story, the 1932 film version of The Most Dangerous Game featured Joel McCrea and Fay Wray as castaways hunted down by the demented General Zaroff on a private island. (The female interest was added to the film and not found in Connell's original 1924 story.) The various segments of the score alternately and evocatively convey the story's lurid yet exciting plot, and, as always, William Stromberg and the Moscow Symphony do a fine job delivering the thrills the scores deserve. The Naxos sound, recorded in 2000, is solid, clean, and bold, with just enough resonance to produce a realistic hall effect but not so much to obscure inner detail. Stage depth is somewhat limited, but width and range are excellent. Also, the disc comes with a nice set of notes, not as comprehensive as the thirty-seven-page booklet of essays that accompanied the Marco Polo release, but enough to tell you everything you might want to know about the music, the composer, and the films. The recording makes a handsome and inexpensive addition to one's library of film music. 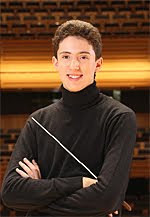 Seattle, WA – Seattle Symphony is pleased to welcome 17-year-old conductor Alexander Prior to an unprecedented Chairman's Fellow position, Assistant to the Guest Conductors. Prior, who is rapidly becoming known in the international music world, will play an essential role in assisting the many high-profile guest conductors coming to Seattle from January through July, 2010 as part of the Music Director Search. The Chairman's Fellow position was created by Board Chair Leslie Jackson Chihuly, who remarked, "We are thrilled to have such a promising young conductor as Alex Prior joining our conducting team. His work will be an asset to us, and we look forward to nurturing his artistic development." Although Prior's role as "cover conductor" is behind-the-scenes, he will play an important role on the Seattle Symphony's conducting staff by being prepared to step in at a moment's notice if a guest conductor is unable to conduct a rehearsal or performance. Serving on the conducting staff of a major orchestra is a key professional development opportunity for young conductors, although most are not given the opportunity at such a young age. Prior has already conducted major orchestras in Europe and Russia, but this position with Seattle Symphony is his first professional appointment. Prior has been selected as one of only 12 participants in this February's International Gustav Mahler Conducting Competition in Bamberg, Germany, the very same competition in which Gustavo Dudamel first came to international prominence. He was Runner-Up in the 2009 Leeds Conductors Competition, and additional conducting engagements include an April 2010 performance with the Royal Philharmonic Orchestra at the Barbican in London, and a Conducting Fellowship at Tanglewood Music Festival during the 2010 festival. In the UK, Prior has conducted The National Symphony Orchestra, Orchestra of Opera North and Northern Sinfonia, among others. He also has conducted the New Opera Orchestra at the Kremlin and The State St. Petersburg Symphony Orchestra. Prior is known to television audiences in the UK following a commission by Channel 4 to compose and conduct the premiere of a concerto featuring extraordinarily talented young musicians. The three-part TV series was broadcast on primetime television in 2009. Prior has been awarded the Patriarch of Russia's Cultural Award for his musical projects that bring culture to disadvantaged children, and he has received the Blue Cross Order for his work in the arts. Alexander Prior has completed his fourth year at the St. Petersburg Conservatory, with distinction. He is a great-great-grandson of Constantine Stanislavsky, the famous Russian theatre reformer and founder of "method acting." Christine Brewer, soprano; Donald Runnicles, Atlanta Symphony Orchestra. Telarc CD-80699. 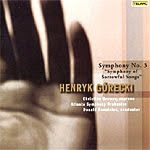 A recording of Polish composer Henryk Gorecki's (b. 1933) Symphony No. 3 "Symphony of Sorrowful Songs" by David Zinman and the London Sinfonietta in 1991 (Elektra Nonesuch) followed the fiftieth anniversary commemoration of Germany's invasion of Poland. The recording became something of a crossover sensation, and Gorecki and his 1976 symphony acquired a renewed international recognition. I wasn't sure how well the composition was holding up over the years, but now Donald Runnicles and the Atlanta Symphony take a crack at it on Telarc, so I suppose the company figures there's still life in the work. I wish them well. The Third Symphony is in three movements, each movement based on a different poem about the loss of a child. The booklet note tells us that Gorecki is a devout Catholic and a highly spiritual man, so there is no surprise that his Third Symphony should be hugely ethereal in nature, each movement proceeding slowly and languorously forward. Frankly, it had been at least a decade since I last listened to it, and I was surprised by how morbidly lugubrious it seemed, incorporating lamentations, exhortations, poetry, and folk music in rather overtly bathetic fashion. This time around it did not seem so spiritual or ethereal to me. I wondered after listening to this new rendition whether perhaps my less-than-enthusiastic welcome of it was really due to the music, the interpretation, or the sound. I'm going with the sound. Compared to the Electra Nonesuch recording, the newer, Telarc sonics are warmer, softer, fuller, billowier, and foggier. The Nonesuch sonics are more transparent and go a long way toward lessening the work's otherwise funereal tone. Nevertheless, if the music inspires you, certainly Runnicles performs it as well as anybody. Anne-Sophie Mutter, violin; Herbert von Karajan, Berlin Philharmonic Orchestra. DG 477 7165. A few days before this rerelease arrived, a friend and I were discussing how quickly record companies and the public tend to forget past recording stars. In particular, we were talking about the conducting icons of the 1960s, 70s, and 80s, people like Solti, Bernstein, and Karajan. 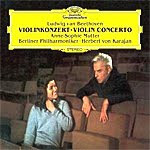 Then the Beethoven Violin Concerto from Karajan and his young protégé at the time, Anne-Sophie Mutter, showed up, with a note from DG saying it is but one in a reissue of several dozen Karajan recordings they're re-releasing. So much for studios not caring. DG originally released this one in 1979, Ms. Mutter's second recording. It is quite good. It is also a bit different in that it is quite slow. The booklet insert tells us that the slow basic tempi were her own choices and not forced upon her by Karajan. Fair enough. But given that Karajan was always prone to slowing down the tempo, providing a little more glamour in the process, and that Karajan had a direct influence on Ms. Mutter's career, I would think that maybe, just maybe, the conductor had some hand in the decision. 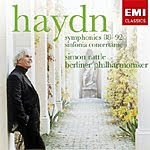 In any case, the performance is lovely, not unlike my own favorite recording from a few years earlier with Szeryng, Haitink, and the Concertgebouw on Philips. Mutter's interpretation is graceful and elegant, if a tad lax compared to say, Heifetz. Still, it's most beautiful, if not for a first recommendation, certainly for an adjunct reference. DG's sound is typical of the era--full and warm--and in its new remastering it sounds more dynamic than ever, with excellent punch throughout. But the midrange, as smooth as it is, is a bit murky and foggy, not quite as revealing as it could be. A quick comparison to the aforementioned Szeryng/Philips recording demonstrates what is lacking here. Nevertheless, the soft acoustic tends to flatter Ms. Mutter's reading, both sounding lush and leisurely. I'm glad I got to hear the disc again. One last thing: This new mid-price reissue comes in a Digipak. Usually, I hate Digipaks. I mean, if you break one of the plastic center spines, what do you do? You've can't just replace the jewel box. But in this case, the Digipak duplicates the artwork of the original LP, and with its glossy cover, it looks really nice. And to carry the theme further, the disc itself is silk-screened to look like a miniature LP. So I can live with the Digipak in exchange for the package's appearance. Gustav Leonhardt, harpsichord. Teldec 2564 69853-2. According to J.S. 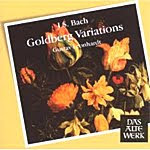 Bach's first biographer, Nikolaus Forkel, Bach wrote the Goldberg Variations in 1742 for a Count Carl von Keyserlingk, who requested them to be played by his harpsichord protégé, Johann Goldberg. He requested that the pieces be of a soothing yet somewhat lively character as might cheer him up in his sleepless nights. However, authorities doubt the story, since the young Goldberg was only in his early teens at the time, and the Variations are of undoubted complexity. Whatever the case, the Variations have come down to us in more-or-less nontraditional fashion, seldom even played as Bach intended. For one thing, Bach meant the work at the time for harpsichord (and while there are many fine recordings like this one nowadays on harpsichord, they are outnumbered by the piano renditions). More important, Bach probably meant the Variations to be played selectively, not all at once as is the prevailing custom, especially in recordings. Gustav Leonhardt, one of the world's leading exponents of the art of the harpsichord, has recorded the Goldberg Variations several times, and I have a another disc of his--from the late 1970's on Harmonia Mundi--to which I compared this earlier, mid '60's Teldec recording. I must admit, though, the differences are of only minor note, and some of them one might attribute to the varying sounds of the harpsichords themselves and the variances in acoustics and recording quality from one session to the other. In both cases, Leonhardt seems perfectly at ease with the music, playfully toying with the more extroverted parts and maintaining a hushed calm in the more tranquil sections. Nevertheless, one notices a slightly more lively spirit in the 1965 Teldec release, as well as a slightly brighter sound; while in the 1978 Harmonia Mundi recording, Leonhardt seems a bit more relaxed, a bit more expansive, and perhaps a bit more contemplative, with the sound in equal measure a bit mellower. I prefer the Harmonia Mundi disc, actually, but it's almost a toss-up, and both recordings provide the kind of reach-out-and-touch-it feeling that puts the instrument in your living room. Also Poulenc: Concerto for Organ, Strings and Timpani; Barber: Toccata Festiva. 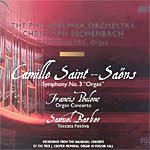 Olivier Latry, organ; Christoph Eschenbach, Philadelphia Orchestra. Ondine SACD ODE 1094-5. I believe it is a law that any orchestra that gets a new organ must christian it by playing Saint-Saens's "Organ" Symphony. Such is the case with the Philadelphia's new Fred J. Cooper Memorial Organ, which the booklet note says is "the largest concert hall organ in the United States. Built by Dobson Pipe Organ Builders, Ltd. of Lake City, Iowa, it has 110 stops and 6,938 pipes ranging from the size of a drinking straw to two feet square by 32 feet in length." Certainly, all 6,938 pipes are on prominent display here, with Philadelphia's Eschenbach excelling in the two opening numbers, Barber's Toccata Festiva and Poulenc's Concerto for Organ. Both pieces are extremely well played and generate a good deal of spirit. It is in the more-familiar Saint-Saens that we find only a middling performance. Things start out well enough with a relaxed opening movement and then a deliciously serene Adagio. But when the music starts to heat up in the second half, Eschenbach sometimes substitutes speed for excitement, and by the time of the finale, his conducting takes on a somewhat foursquare, oddly mechanical feeling. Not that any of the reading is bad, mind you; it's just a little different, and neither as exhilerating nor as smooth as my two favorite interpreters of this work, Fremaux on EMI and Munch on RCA/JVC. Ondine recorded the organ's inaugural performance live in May of 2006, but you'd hardly know it was live until the unfortunate eruption of applause at the end. There is an excellent sense of space and depth to the sound, with a dynamic range so wide that if you are tempted to turn the volume up during the "Organ" Symphony's quiet opening chapters, you'll get knocked out of your seat as the piece moves on. The bass is also deep and satisfying, something necessary for the piece to work, but, to be fair, it is no deeper or more comforting than the bass on the Fremaux disc. Incidentally, at the very bottom of the back of the jewel box and slipcover, you'll see the designation "SACD." I have no idea if the disc is recorded in more than two channels because nowhere does the booklet say, and I have an SACD player hooked up only to a two-channel system. But it is a hybrid disc, playable on SACD or regular CD machines, and I did notice a very slightly, very marginally wider response from the SACD layer than from the CD layer.